Arthur is the first true cat-of-the-day, the other pictures having been playing catch-up since I decided to start this little blog of phone sketches. Arthur, washing, on a newspaper. Why he feels it necessary to wash on a newspaper is anyone’s guess… presumably it was not with the intention of keeping my desk clean, since this was the same Arthur who was having a midnight-rabbit-snack on the lounge carpet last night as we came home from the pub. 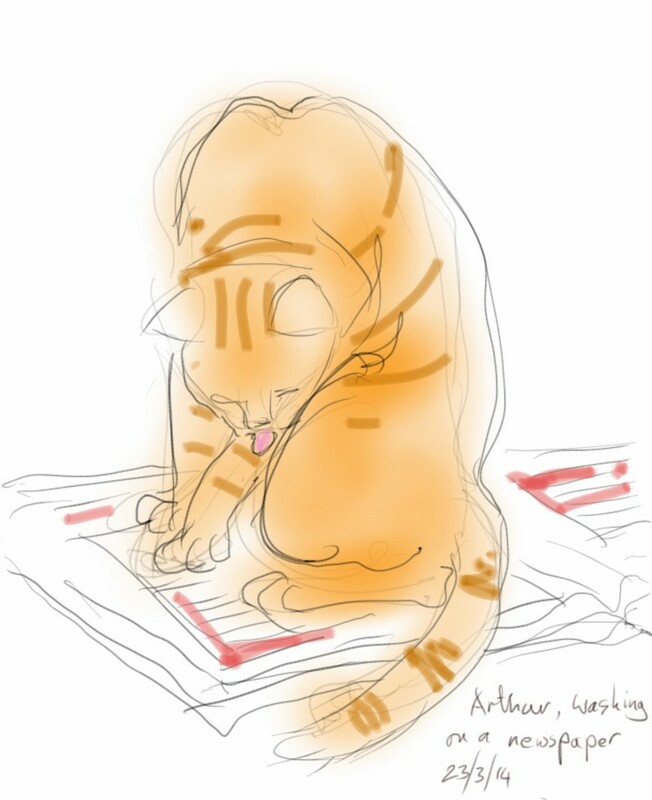 This entry was posted in Cats and tagged art, arthur, cat, cat washing, digital sketch, drawing, ginger, illustration, phone sketch on March 23, 2014 by Nancy Farmer. I really like it. You captured the moment perfectly. Thank you 🙂 you have to be quick, with non-sleeping cats! LOL I have the same dilemma, but with photos. ah now that is an interesting point, because a sketch takes longer, but i can make up the bits that I glimpsed fleetingly… can’t make it up with a camera: if you missed it it’s gone!